Kalamazoo College students, faculty and staff will take part in events Friday, Jan. 18, and Monday, Jan. 21, to celebrate Martin Luther King Jr. Day. The events are open to the public unless otherwise noted. 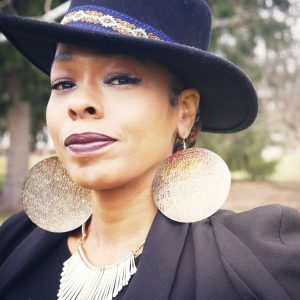 Tasleem Jamila, an international poet, vocalist, author, speaker, educator and holistic health advocate, will be a guest performer at the Martin Luther King Jr. Convocation Monday, Jan. 21, at Dalton Theatre. This exhibit is an award-winning collection of more than 7,000 original artifacts of Black memorabilia dating from the trans-Atlantic slave trade era to hip-hop culture. The Black History 101 Mobile Museum has traveled to 32 states, visiting more than 300 institutions including colleges, K-12 schools, corporations, conferences, libraries, museums, festivals, religious institutions and cultural events. Community members are invited to stop by throughout the day to view the exhibit. Khalid El-Hakim is the founder and curator of the Black History 101 Mobile Museum. He has received national and international attention for his innovative work of exhibiting Black history outside of traditional museum spaces. Most recently he was named one of the 100 Men of Distinction for 2017 by the highly respected business magazine, Black Enterprise. He holds a master’s degree in socio-cultural studies of education from Western Michigan University and is a Ph.D. candidate at the University of Illinois Urbana-Champaign. Dylan Milton ’21 will be the student speaker. Tasleem Jamila, an international poet, vocalist, author, speaker, educator and holistic health advocate, will be a guest performer. She is the CEO of My Soul Speaks, a company that creates interactive workshops, presentations and performances across the world. Her work focuses on social action, community healing and revitalization through art and expression. Khalid will be available at the museum exhibit for questions and one-on-one dialogue about the Black History 101 Museum and the exhibit at K. Tea, coffee and lemonade will be available. Brunch will be served at 12:45 p.m. followed by a 70- to 80-minute workshop. Attendance is limited to 40 students. RSVP to Natalia T. Carvalho-Pinto at ncarvalh@kzoo.edu to attend. This event is open only to students from Kalamazoo College, Western Michigan University and Kalamazoo Valley Community College. Kalamazoo College participants will ride buses from Red Square to MLK Park in Kalamazoo. After the MLK Park event, participants may take buses back to K. One bus will take participants to a celebration at the State Theatre, after which a 6 p.m. bus will return participants to K.
Immediately after the Martin Luther King Jr. Commemorative Walk, Bronson Healthcare and Ascension Borgess Hospital invite the public to a community celebration. For accommodations and further information, contact Mikka Dryer at 269.341.8323 or Sister Sue McCrery at 269.226.5937. 7 p.m., Movie Night and Discussion, Intercultural Center at Hicks Student Center. Kalamazoo College students, faculty and staff are welcome to watch the movie “Selma” with popcorn and pizza provided. This entry was posted in News Stories and tagged diversity, students, . Bookmark the permalink.